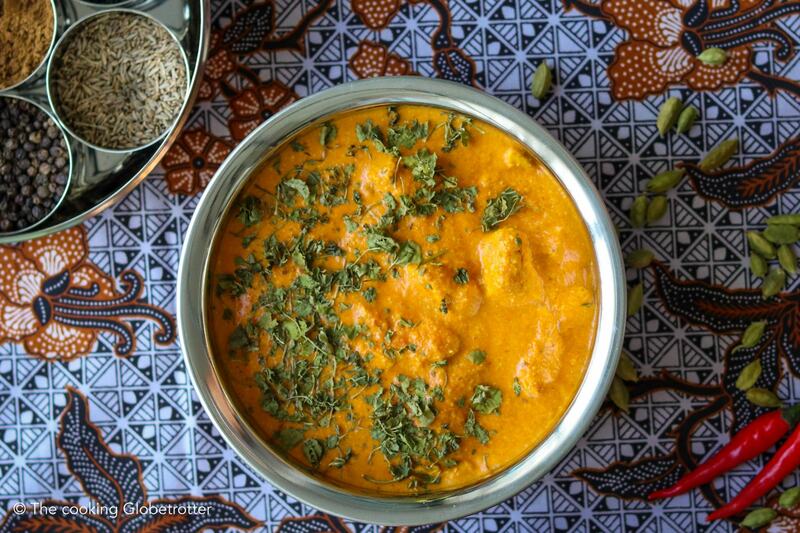 Butter chicken is probably the most common and well known Indian dish. Did you know that it is quite easy to make at home? This way you will be able to adjust how spicy and creamy it is going to be and you will make everyone happy in the family! You will need to marinate the chicken first (overnight or at least a couple of hours) and then prepare the sauce separately. Clean and chop your chicken in cubes (approximately 2×2 cm). Place it in a bowl with 4 tablespoons of natural yogurt, 2 cm of peeled and finely chopped ginger, 2 garlic gloves finely chopped (you can chop the ginger and the garlic together), the chili (1 whole for spicy, 1/2 for mild, omit if you don’t want it hot) finely chopped, 1/2 teaspoon of turmeric powder, 1 teaspoon of salt, 1/2 teaspoon of chili powder and 3/4 teaspoon of garam masala powder. 3. Mix it all well, cover it and let it marinate in the fridge overnight or for 2-3 hours (the longer the better). Time to cook the chicken: heat 2 tablespoons of coconut oil (or extra virgin olive oil or ghee) in a big non-sticking pan, cook the chicken for about 5-6 minutes, turning it every couple of minutes. Set aside and move on to the sauce. Take a big saucepan (one, where you can use your hand blender in it), heat 3 tablespoons of coconut oil (or olive oil or ghee), add 1,5 teaspoons of cumin seeds once the oil is hot and let them splutter for a minute. Add 2 chopped onions, ginger (2 cm peeled and chopped), 2 garlic cloves chopped and the chopped chilli (whole for good heat, 1/2 for mild and omit for not spicy). Stir well and fry until the onions start to caramelize, add a little bit of water if necessary (before everything burns!). Brake the cashews roughly in a morsel or with a meat tenderizer (in a ziplock bag) and throw them in the saucepan, let them fry for a couple of minutes then add one can (400 ml) of pureed tomatoes. Turn the heat off and blend everything carefully with your hand blender (you can also use a standing blender, of course, here you may need to add some water). Add water if it is too thick and not easy to mix. Turn the heat under the saucepan back on and add 1,5 teaspoons of coriander powder, 1/4 teaspoon of chilli powder, 1/2 teaspoon of turmeric and one teaspoon of salt. Time to marry the chicken and the sauce! So add the cooked chicken with all its juices to the sauce and cook for 8-10 minutes at low-medium heat (cover it if it splutters). Add one glas/cup of water then (or earlier if you notice that it is too thick) and bring to boil. Reduce heat, cover and cook for another 10 minutes. Almost done, we just need to add the finishing touches: add 3/4 teaspoon of garam masala powder and 3 pounded (or smashed) cardamoms and stir well. Add 150 ml of cream (more or less, depends on how creamy you want it to be! ), mix well. Sprinkle with 3 tablespoons of kasuri methi (dried fenugreek leaves or coriander or parsley if you can not find them) and serve hot with steamed rice and/or naan. 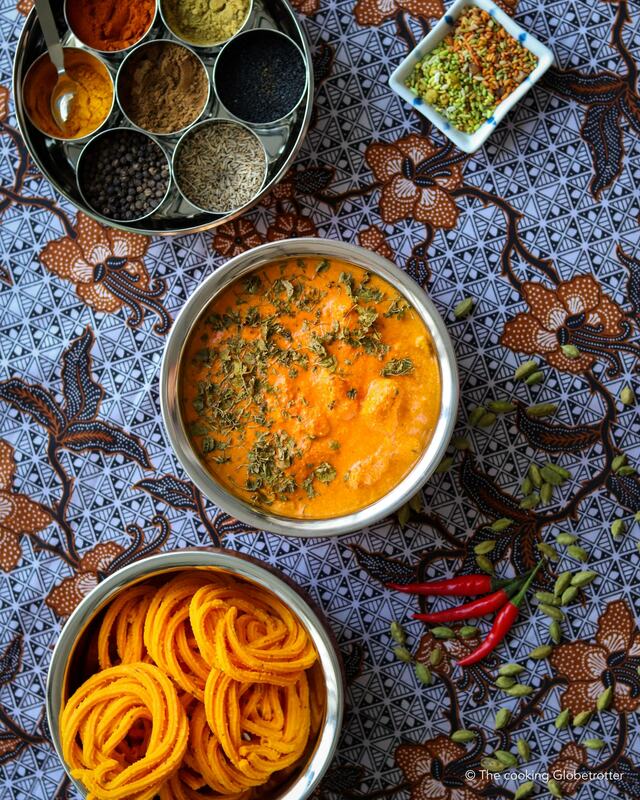 Thanks to Payal Thakurani, who introduced me to the Indian kitchen and keeps inspiring me with her recipes on her book Curries for the Soul. 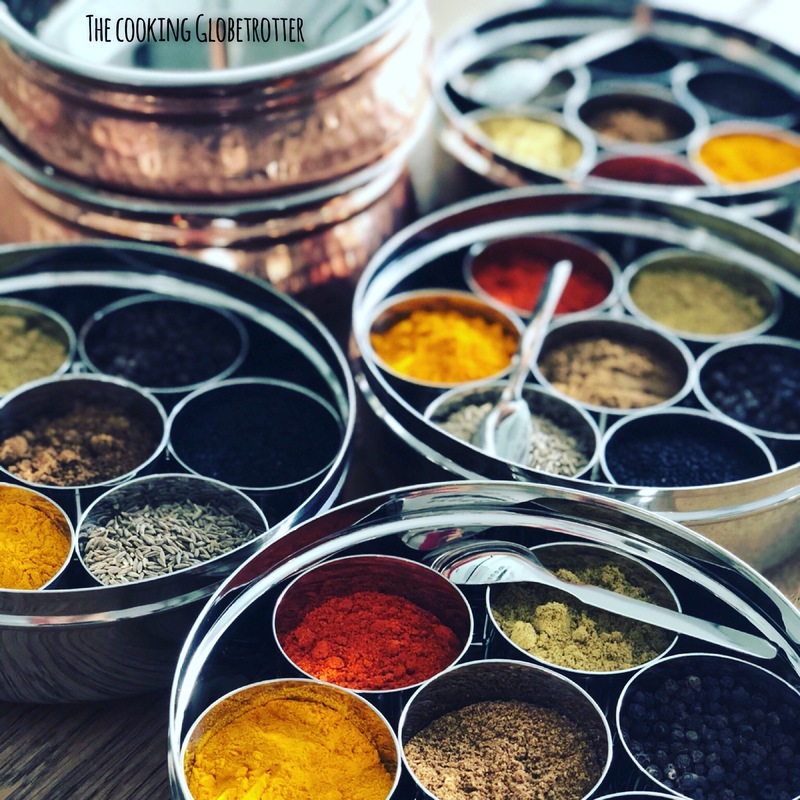 Check out all of my Indian recipes here on the blog, from curries to sweets, you will be able to make your own Indian feast! Clean and chop your chicken in cubes (approximately 2x2 cm). Place it in a bowl with 4 tablespoons of natural yogurt, 2 cm of peeled and finely chopped ginger, 2 garlic gloves finely chopped (you can chop the ginger and the garlic together), the chili (1 whole for spicy, 1/2 for mild, omit if you don't want it hot) finely chopped, 1/2 teaspoon of turmeric powder, 1 teaspoon of salt, 1/2 teaspoon of chili powder and 3/4 teaspoon of garam masala powder.3. Mix it all well, cover it and let it marinate in the fridge overnight or for 2-3 hours (the longer the better). Turn the heat under the saucepan back on and add 1,5 teaspoons of coriander powder, 1/4 teaspoon of chilli powder, 1/2 teaspoon of turmeric and one teaspoon of salt.Time to marry the chicken and the sauce! So add the cooked chicken with all its juices to the sauce and cook for 8-10 minutes at low-medium heat (cover it if it splutters). Add one glas/cup of water then (or earlier if you notice that it is too thick) and bring to boil. Reduce heat, cover and cook for another 10 minutes. Thanks! It’s one of our favourite Indian dishes as well and it’s great being able to adjust the heat for the whole family!